This page presents the courses and other teachings available online, some of which come from the "Teaching From the Roots" program. It will be updated as more videos become available. Online video courses certified for credits (CEU, PDA and others) are listed in the credits section › of this page. 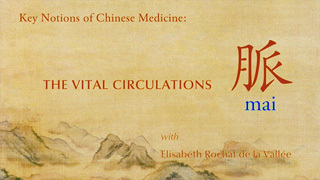 A detailed review of the emotions in Chinese Medicine according to the medical Classics; their vision as qi movements, their relation to the heart-mind and all aspects of their normality and pathology. No study of Chinese medicine can be complete without an understanding of the Eight Extraordinary Meridians, which are unique in their primary function as source-spring of regulatory power on blood and qi in the human body. In a human, the first manifestation of Heavenly Yang (Dumai or Governor Vessel) and Earthly Yin (Renmai or Conception Vessel), allows a powerful fusion, creating the surge of life (Chongmai); this efferverscence is controlled, as if girdled (Daimai) to enclose a vital space. Two couples come to regulate the yin-yang (blood-and-qi) relationship in an intrasystemic (yin and yang Qiaomai) and intersystemic (yin and yang Weimai) perspective. This course is an in depth study of each of the Eight Extraordinary Meridians as they appear in the Neijing and the Nanjing, including their development as a unique group of meridians. Each extraordinary meridian will be studied in detail, and its underlying philosophical statement will be explored. The detailed presentation of the major associated Classical texts will deepen and enrich our knowledge. The course includes: A general presentation, a detailed presentation, the Dumai, the Renmai, the Chongmai, the Daimai, the Qiaomai and the Weimai. Jing, the Channels (or Meridians) are the norms that structure all forms of circulation in the body and control the flow of qi. 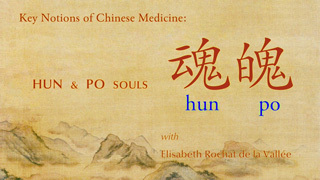 Two of the Five Aspects of the Spirit (shen 神), associated with Heaven and the Liver (Hun), and with Earth, the Lung (Po). Those two Aspects of Spirit linked with the Spleen and the Kidney are the state, the content and the functioning of the heart/mind. Often the most basic concepts of Chinese medicine are the least understood. 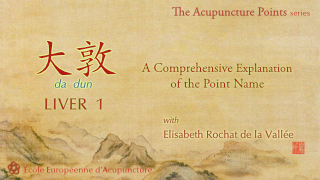 This study of the key notions of Chinese medicine is an attempt to fill the gap, helping practitioners make the connections between the Classics and their practice. Each key notion is presented through its character, its uses and meanings in the Chinese classical and medical texts, and with its main correlated notions. Key sentences and excerpts are studied directly from the source texts, including discussion of their practical applications. 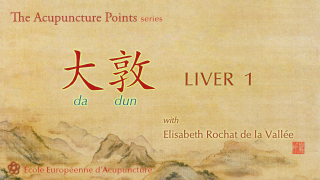 The Liver 1 - 大敦 dadun acupuncture point, the first point of the Foot Jueyin Liver meridian. Taken from the study of Liver 1, the comprehensive explanation of the point name that helps explain the point's functions, position and roles. An in-depth study based on the Chinese Classics, on the deep insight of great masters of the past, and on the knowledge of their cultural environment. These presentations set up a firm foundation for the correct use of the points, which become familiar so as to be easily and naturally used. Wilting (limpness, muscular atrophy) pathologies associated with the Wei Syndrome are only fully understood by studying the texts presenting their primary causes. The best is the Suwen chap.44, studied in depth in this course. 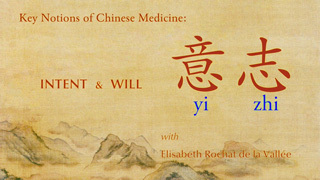 Based on the study of Suwen chapter 44, Jinguiyaolüe and other classical Chinese medicine texts, Elisabeth Rochat de la Vallée presents the main characteristics of Wei, often translated in English by "wilting", "atony", "wasting" or "limpness". A general presentation. Analysis of the character wei. What is called wei in pathology. Structure of Suwen chapter 44. The five parts of the body as composing a body of qi, a body in motion. The effect of the lung internal heat and how it is the first to be responsible for limpness and for a wei symdrome. Lung wei in the Jingui Yaolüe. Beginning of the heat of the heart. The internal heat in the heart, in the liver, in the spleen and stomach leading to various wei syndromes: wei of the circulation (or vessels), of the muscular movement (or sinews), of the flesh. The internal heat of the kidneys causing a wei of the bone. Presentation of the primary causes : how emotions produce and internal heat in the lung, the heart and the liver, creating specific wei. Discussion on zong jin (ancestral muscle, converging of muscular forces) and more on the inner heat of the liver. Dampness harms the spleen, heat harms the kidneys, producing specific wei. Diagnosis according to the five zang organs. Why the wei pathologies are always treated at the Yangming. More on the zongjin. Relation with Chongmai and Daimai. Treatments at the brook (ying) and transport (shu) points. A video presenting the therapist's Code of Ethics based on the Chinese Classics and Medical texts is also available here › It is also available for NCCAOM PDAs. Many more videos are available in French; they are presented here ›.